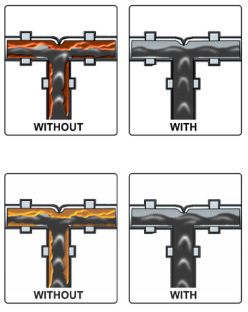 Drag Reducing Agent additive functions as a Fluidifier additive to the crude oil mass by positively altering the frictional pressure occurring in a pipeline or other conduit. Drag Reducing Agent additive to the crude oil mass modifies the thixotropic characteristics of the crude oil mass to achieve a more favorable kinematic viscosity without altering the initial composition of the crude oil mass. This is the process of fluidification by molecular dispersion. Drag Reducing Agent additive achieves reduction of turbulence induced drag in the pipeline of the crude oil mass due to a rearrangement of the bonds between atoms in the crude oil without altering the inherent properties of the crude oil. This decreases pressure in the pipeline resulting in a higher flow stream at the same pressure. This is new chemistry as the alteration in the bonds between the atoms within the crude oil creates an energy demand which is recovered by the energy previously lost in the region of the turbulent flow. Drag Reducing Agent additive to the crude oil mass compels a full understanding of complex interaction of the varying properties of different crude oil mass such as the type of crude oil (asphaltic or paraffinic, etc. ), composition and pH of the water, temperature, extent of compression by pressure, dissolved gas, contact time, and concentration of polar molecules. Drag Reducing Agent additive also can be enhanced to accomplish many more beneficial functions as well if the underlining chemistry is properly designed as a “building blocks” system. Drag Reducing Agent additive to the crude oil mass assists in the movement of the crude oil mass of varying API degrees and viscosity from the production and extraction casing through the upstream gathering system, midstream pipeline, tanker, storage tanks and delivery flow stream system and downstream at the refinery. Drag Reducing Agent additive facilitates the uniform and continuous flow of the crude oil mass to prevent clogged production wells and flow stream processes and prevent interruption of the production and flow stream delivery or renewed production of inactive wells. -Drag reducing agent which continues to work as pressure and temperature changes in pipeline or conduit. -Drag reducing agent does not evaporate because it incorporates into crude oil mass. -Drag reducing agent applied in significantly smaller dosages of 0.1% to 0.5% by volume of crude oil treated vs. 10% to 20% by competitive additives which evaporate and require additional treatment. -Drag reduction agent additive solves one of the 15 common profit robbing “pain points” in production and flow stream delivery of crude oil. -Drag reducing agent additive resulting in more crude oil profit at lower costs, because “Every Drop Counts”.